If you would like to Donate and help support the KFCF, please visit the Donate Page for more details. ♦ Travel: Wakefield, trl 8 Bergland, Lake Gogebic, trl 13 Greenland, trl 3 Twin Lakes, trl 13 Greenland, Mass City, trl 12 Rousseau, Sidnaw, Kenton, trl 107, trl 2 down to Iron River, Caspian, trl 2 back to Wakefield, lastly circled on Sunday Lake to meet my mileage. ♦ Notes: It is such a great feeling remembering how people didn’t think I could do 15,000 miles and here I am coming up to 56,000 miles. I just love how people point and smile at the sled and thanking me for what I do. I remind people that this is a WE effort; that none of this would all be possible with out my family and friends along side of me with all of their support. Like I always say, ‘I have the easy job of riding the sled and they get all of the rest’. Well, the trails were very nice today and guess what? It is finally snowing this evening! I will once again be able to take off directly from Ironwood and not have to trailer 15 miles away. Tomorrow will definitely be a special day as Mary Jane and I will ride the first 100 miles then the final 56 will be with my wife Janet riding along side. (Unless trails are not good then I may travel more on my own.) I just need to pick my final destination for my big moment… Lately, a big THANK YOU to Pat and Kip at Pat’s Yamaha for buying a tank of gas today. ♦ Travel: Wakefield up to Copper Harbor and back. ♦ Notes: Well I woke up this morning a bit more rested and got going changing my oil, chain case oil, and greased the machine. I met a lot of people out on the trails and stopped for pictures along the way. Just lots of smiles from everyone who saw Mary Jane. People are just amazed to see all of those miles on one sled. It is also amazing when I tell them it is only the 180th day that she has been ridden. That averages out to be 308 miles/day. People just smile from ear to ear and just shake their heads. WOW! Otherwise, I did a lot of garbage clean up on the trails. There was times that I had so much in my lap that I couldn’t stand up to hold it all on the sled with me until the next stop. Lastly, I want to wish little Emily Kern a Happy 8th Birthday tomorrow. I’m wishing her tonight so that she reads it in the morning (we had to write it on the calendar when the family was up snowmobiling so that I wouldn’t forget). Have a great day! ♦ Travel: Trl 106 in Michigan for the first ride for the day and the second ride was in Iron County, Wisconsin. ♦ Notes: It was a bit of a slow start for the majority of the riders. It was a long exhausting but yet inspiring day yesterday. Mary Jane was running great and we definitely enjoyed all of our miles through these past years. I did a lot of thinking today especially as I rode up trail 106 earlier this afternoon needing to clear my thoughts (this was the trail that I took Jane on for her bucket run and knowing now that she was so close to her death). I just had this overwhelming feeling when I was out there that I was taking my parents on a final ride down memory lane…all the special moments in life that I hold in my heart…all the stories…all of the people who have walked right up to me and gave me a glimpse into their lives. I was so exhausted, tired, and genuinely emotional for all that has happened through these past years. I could never have imagined that I would have been having all of these feelings. I think I was always viewed by my daughters as this strong father -a mason who didn’t cry much but here I am all these years later choking up with emotions. I just simply become overwhelmed and can’t even speak sometimes. I just cry and shake my head. Even knowing everything that I know now I would do it all over again. Keep pushing harder, don’t ever give up on your dreams, and find someone or something that inspires you to keep moving forward. I love you mom and dad. Good Night everyone – will talk again tomorrow. ♦ Travel: Wakefield, trl 2 to Florence, spiked up to Crystal Falls, up to trl 15, trl 107 Kenton, trl 8 Baraga, trl 8 to 109, trl 12 Rousseau, trl 3 Twin Lakes, Hancock, trl 17 to 3, up to split of trl 3 and 134 intersection, turned around and headed back down trl 3 to 17, trl 3 to 13, Greenland, Bergland, trl 8 to Wakefield. ♦ Notes: What a day….what a day! We started out by trailering over to Wakefield so that we could at least start riding on some snow. Then Randy J (who is currently fighting his own battle with cancer) led us down the trails for about 60 miles. 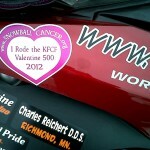 I give him a lot of credit for everything he did for this ride and all of his great community efforts. One man may not be able to change the world but when a community of friends work together we can! I really appreciate all of the great friends and community that I have surrounded me. We all had such good spirits today and had such a great inspiration to keep us going all day long. Also with the minimal snow that we have gotten this winter; we only had about 30 miles of bad trails (not bad out of 610 miles). A big THANK YOU to the groomer drivers for doing an excellent job within the state of Michigan. Also a big THANK YOU to Nancy & Pat for filling a tank of gas as well. We all had such a great time enjoying all of those miles and stopping for our occasional snacks and water. Thank you to everyone for showing your wonderful support to the foundation and myself. ♦ Travel: Wakefield, trl 8 Bergland, Lake Gogebic, trl 13 Greenland, Twin Lakes, trl 3 Houghton, turned around and all the way back to Wakefield. 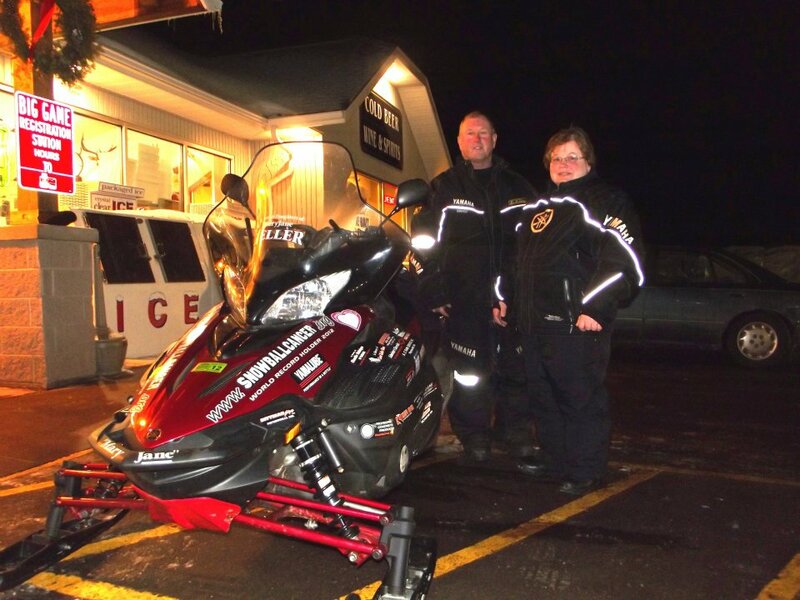 ♦ Notes: Well we ended up trailering the sleds about 15 miles to Wakefield since there was absolutely NO snow. It was great getting in a pre-Valentine run and being welcomed by so many in the surrounding community. I even had a group from Illinois flag me down on the trail to talk with me and see if I was ‘that guy’. 🙂 It is always such a great feeling to say, ‘YES, it is me’. It was also great getting a voicemail from my daughter in Australia wishing us good luck tomorrow. A big THANK YOU to Scott & Nancy, Nancy & Pat, and Mike & Sue for buying the gas today. I truly feel like I am an old race horse – -running strong until the end – -only if there was more snow to keep going for the winter. I also got a great surprise back at the house tonight when a good friend, Randy (who is the President of Richmond, MN snowmobile club) who is currently going through his own battle with cancer showed up in Ironwood. Even a person struck with cancer can be so selfless to think of others in need and has raised pledges on his own for the Valentine 500 run. Even Randy wants to ride close to 100 miles tomorrow along side the rest of us. What strength, courage, and determination one can have is simply amazing. So tomorrow is the big day. Randy J, Nancy L, Mike G, Scott K, Wayne K, and I have taken on the challenge to see how many miles we can push ourselves to go in one day. Please keep all cancer patients in your thoughts and all who have passed away before their time from this horrible disease. 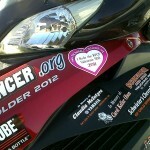 They fought hard for their lives and we will ride in their honor tomorrow for Valentines Day! ♦ Travel: Made my way down to Iron Mountain, back and forth on trails, then back up Ironwood. ♦ Notes: Before heading out for the day I had to change the hi fax since they were pretty worn out from the lack of snow on the trails. I think I saw more wild life (deer and fox) out on the trails than I saw people today. I really only talked when I filled up for gas. Otherwise Mike, Nancy, and Scott all arrived in Ironwood tonight. We will all head out and take a few warm up laps snowmobiling tomorrow before our big day on Tuesday. Two out of the three of them haven’t been out riding all season so far. So they will have a bit of a workout tomorrow for their intense warm up ride. ♦ Travel: Made my way up to Copper Harbor and back to Ironwood. ♦ Travel: Ironwood, trl 2 down to Florence-WI, up to Crystal Falls, back to trl 2, up to trl 107 Kenton, Sidnaw, trl 109 to 12, trl 3 Twin Lakes, back down trl 3, trl 12 to 109, trl 8 Kenton, trl 107 to 2, back up to Ironwood. ♦ Notes: It was sure nice to wake up with fresh snow on the ground. It wasn’t much but good enough for me to take off straight from the house and not have to trailer the sled and lose the miles. I was sure glad I wore all of my Klim clothing on this very cold windy sub-zero temps day. I had a great time talking with people, taking pictures (some of me and some of others with the sled), and also meeting up with a DNR from Crystal Falls (he said he signed my book last year too). Otherwise, it felt good pounding on the miles to make sure those young people coming to ride next Tuesday know that this old guy is ready to go for those high miles. Lastly, I want to wish my daughter Carrie down in Australia a great HAPPY BIRTHDAY today! ♦ Notes: WHAT A DAY. We had to trailer the sleds about 40 miles away to Bergland to be able to start sledding on some snow. Therefore I am losing out of critical miles. I need snow and a lot of it and these little flakes that are falling tonight is not doing me much good. The sledding is pure work for the guys riding with me. Wayne even had to lay down on the trail as we were heading back to take a short break. A big THANK YOU to Kip at Pat’s Yamaha for filling gas today again. It has been great talking with people; giving them trail advise, talking about the Valentine 500+ run; and about Jane’s bucket list. People often ask me about why her name is underlined on my sled. I am very happey to tell them about Jane’s story and how she was able to cross out a wish from her list when we brought her out for a snowmobile ride back in 2008. You can’t ever truly express your feelings that you have when you meet and can fulfill a persons wish before they pass away. Jane will forever be in my memories (she would have been 51 years old yesterday). Mike said it best when he talked about how we can’t complain about the trails that we are riding or the lake being boring to make circles on if the snow is not here…. Cancer patients have no choice what path they have to take but they still move forward and take on the challenges ahead. 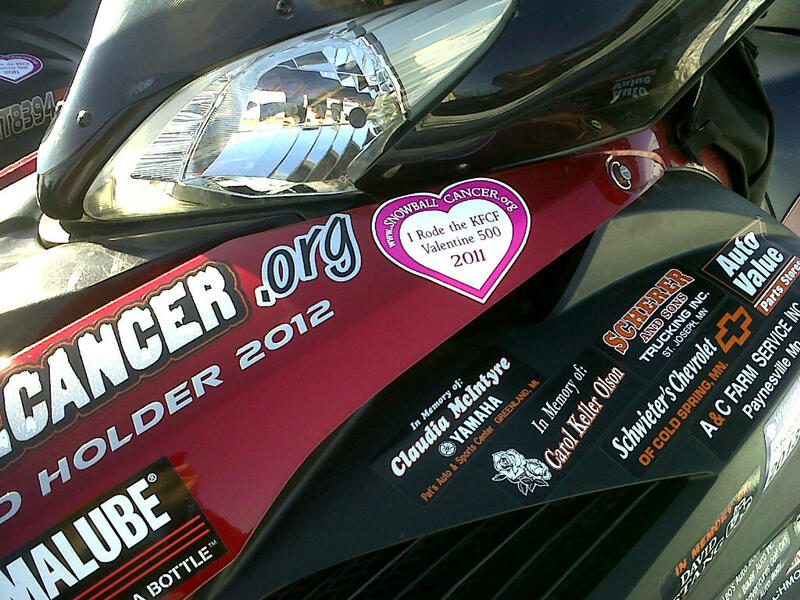 Therefore, I will keep riding to support and raise funds for those with cancer. ♦ Notes: We trailed the sleds over to Wakefield and unloaded at 12:18pm. Wayne, Joe, and I rode the lake and up to Greenland and tried to enjoy our self with the little snow that there is on the trails. I want to give a big THANK YOU to Kip at Pat’s Yamaha for buying gas today. It was great stopping in at stops and having people say, ‘Aren’t you that guy that everyone is talking about?’ – I say yes that is me. They are talking about it a little more in the area being that I and Mary Jane were on the front page of the Daily Globe which is the Ironwood, MI newspaper. Well, I am going to rest up for the night and hope for snow tomorrow. Oh one last thing I wanted to point out for the day. It always amazes me how the numbers always work out. For my 25 days of riding this season I have a total of 7070 and my average is 282.8 exactly (70/70 and 28/28). ♦ Travel: Trl 15 to 13 S, trl 17 up to Ironwood, trl 2 down to Watersmeet, trl 107 to Kenton, back down to Watersmeet, trl 2 Marenisco, trl 11 S, trl 14 W, trl 10 W, trl 8 N, trl 17, trl 15 circled up to trl 77, Ironwood. ♦ Notes: A quick THANK YOU to Marcy for filling a tank of gas today. Well, this was one of the hardest days of riding since the trails have gotten very tough. No snow, no ice, just black dirt all around the different areas. 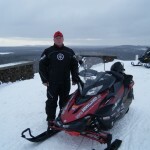 Tomorrow Wayne, Joe, and I are going to trailer the sleds about 10 miles away before sledding for the day. I hope snow comes soon so that I don’t have to stop riding. Otherwise, it was a very special day riding in memory of my sister Carol who passed away from cancer just this past December. It was kind of neat how as I came back into Ironwood this morning their was a bald eagle that flew over me for about 2 blocks. It was a special sign. ♦ Travel: Trl 2 down to Watersmeet, trl 107 Kenton, trl 8 Sidnaw, trl 12 Rousseau, Greenland, trl 13 Twin Lakes, trl 3 back to 12, trl 8 to 107, lastly trl 2 up to Ironwood. ♦ Notes: Want to start out my wishing my grandson Alex a HAPPY 9th BIRTHDAY today. Well, I woke up early this morning to change the oil and give Mary Jane a bath. She was getting pretty dirty with the lack of snow. 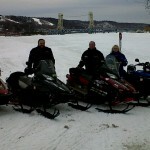 I really enjoyed meeting up with Mike and Brian Peters from www.snowsnakes.com. I want to give them a big THANK YOU for paying for 3 gas fill ups, dinner, and on top of all that making a nice donation. I also need to THANK Jim and Beth Vos for paying for a gas fill up as well in Watersmeet. They beat Mike to the register. 🙂 They were really excited to see the sled pull up when they were there as well. During our multiple stops throughout the day they really got to see how long it takes me to fill up gas (well not really the gas fill up part but rather the talking with people and picture takings). It was really great meeting people from Madison and Fort Atkinson, WI; International Falls and Rochester, MN; Detroit, MI; and even Indiana. It is always exciting to meet people from all of the states watching on the website and reading all about the foundation. We really had a great time! Well hopefully it will snow soon since we only have one week until the big Valentine 500+ day arrives. It has been a long 7 days of having over 300+ miles a day in a row. Also, tomorrow will be a special day in memory of my sister Carol who passed away just this past December from cancer at the young age of 52 (so for that I will be completing my ride tomorrow in memory of her). ♦ Travel: Trl 2 down to Crystal Falls, trl 113 N, circled to Amas, trl 111 to 15, back to trl 2 S, then turned back up to Ironwood. ♦ Notes: Man is it warm out there. This is turning out to be a sad looking winter with very little snow. Snow…where are you? I have been searching for the good trails and trying to find trails that not many others may travel to have the best ride that one can find out there. Other than the lack of snow I am enjoying my gas station stops which consist of talking and picture taking. Also getting a lot of thumbs up on the trails as I past people. It is always nice to see all of the great support. I am a little tired from the long day and hope to get some good sleep tonight. ♦ Travel: Trl 2 down to Watersmeet, trl 107 Kenton, Sidnaw, trl 12 Greenland, turned around back to trl 12, Sidnaw, trl 8 to 15 S, Casper, trl 2 back to Ironwood. ♦ Notes: I had a great time today stopping in at Pat’s Yamaha in Greenland; having a cup of coffee, petting the dog Sammy, and talking with people. It was just relaxing to sit and talk with people. I met some people from as far away as Illinois, Indiana, and Mora, Minnesota. A big THANK YOU to Kip at Pat’s Yamaha for filling a tank of gas. When I was out riding it is starting to feel like last year where the snow was disappearing and only riding on dirt and ice near the Ironwood area. We really really need snow! I think my uncle Jerry needs to start praying a little more for me. Other then that as I am riding alone and the snow is melting I am finding lots of stuff on the trails. So I try to stop and pick the garbage up to keep it clean out there for when the snow comes back. Lastly, I want to wish my grandson Sean a HAPPY 9th BIRTHDAY (since it is technically February 5th in Australia already). Hope you are enjoying the sun. ♦ Travel: Trl 2 down to Iron Mountain, Quinnesec, trl 5 N to Dickinson, trl 16, Crystal Falls, trl 113 to rtl 2, Florence, trl 2 back to Ironwood. ♦ Notes: Want to start out with a big THANK YOU to Peggy Robeck; Wayne & Bonnie Koplin; along with Ron Buerman for each paying for a tank of gas today. I had a great time adventuring out onto new trails that I had not taken before. I even got to thank a groomer operator for doing such a great job with the trails. The trails are holding up pretty good for the lack of snow this winter. Otherwise I met a lot of people from all over the states (Illinois, Milwaukee, Michigan) and handed out alot of cards. ♦ Travel: Trl 2 to Watersmeet, trl 107 Kenton, Sidnaw, circled around back to Greenland, trl 13 Twin Lakes, trl 3 Mass City, trl 12 Rousseau, Sidnaw, Watersmeet, trl 2 back to Ironwood. ♦ Travel: Trl 8 to 3, Twin Lakes, Houghton, loop around, Twin Lakes, trl 3 back to Greenland, 2 hour layover, trl 12 White Pine, trl 1 Silver City, trl 11 Bessemer, trl 2 Ironwood. 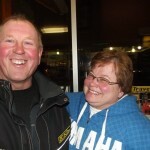 ♦ Notes: Want to start out with a big THANK YOU to Wayne & Bonnie Koplin along with Pat’s Yamaha for each buying a tank of gas today (also Trish for the lunch). Also, I do not want to forget to wish Nicole (my youngest granddaughter) a Happy 7th Birthday. Well, today was completely dedicated to Claudia McIntyre. I thought about how much you mean to me and how your family supports the foundation. It truly means a lot….. more than words can express. So for that I made sure that I and Mary Jane were parked directly in front of Pat’s Yamaha in Greenland, MI when the odometer turned 50,000 miles. I had a great time taking pictures with everyone and especially for getting pictures with Pat, myself, Mary Jane, and Claudia’s name on the sled. I bet she was smiling down on me all day. I know that she would have been very proud of us today and for that I will always remember where I was at when she flipped to 50K. It was also great getting to meet people from central Iowa, New Jersey, and even Missouri at different places filling up gas. Don L, Roger M, and Greg said that they have been watching since the day I started all of this snowmobiling back on December 26, 2009. People are just so amazed at these miles on the sled and how great she still looks. Some people even tell me that they have read all about me in the articles and website but never thought they would ever meet me in person….then suddenly there I am standing in front of them. They just smile so big and ask if they can take pictures. 🙂 It is so amazing how one small dream can turn to be so big if you only believe. Well good night everyone and thank you Claudia for believing in me. ♦ Travel: Up to Copper Harbor and back. ♦ Notes: I took some last photos with the Kern kids before they headed back to Minnesota. I had a great time and enjoyed our rides. I decided that since the kids worked very hard for our 223 miles yesterday that I would turn around and put over 400 today. It was great meeting all of the people along the trails and the pit stops. 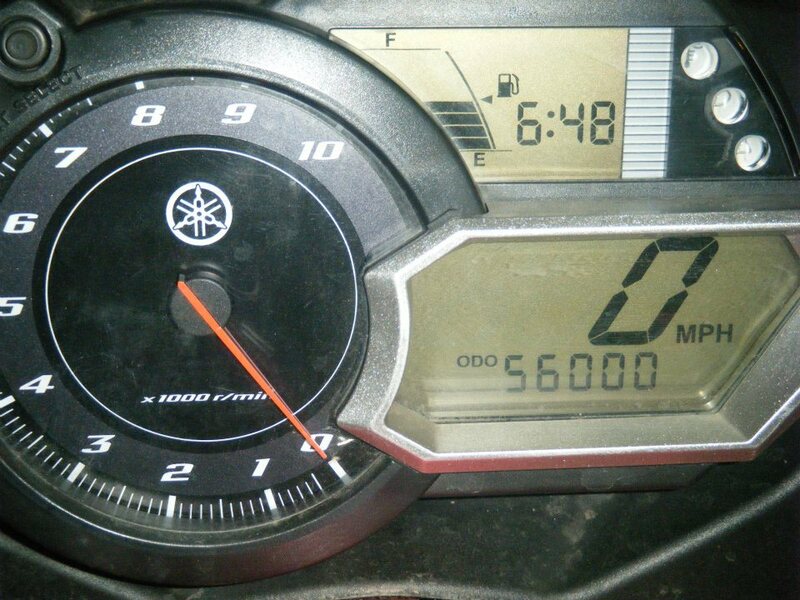 I enjoy hearing people yell ‘how many miles you got?’ and when people have told me that they bought a Yamaha after reading all the articles on me. It is just great. A quick THANK YOU to Marcy for filling a tank of gas today. Emily just to let you know that I found some more red sand for you for show-n-tell (I will have to go back to it with a spoon to get it out). Otherwise, I did a lot of thinking about the sponsors and the general public for all of the great support they have given the foundation and myself. I truly could not have done it without all of the support. My small dream of helping people could not have been possible without you. THANK YOU! 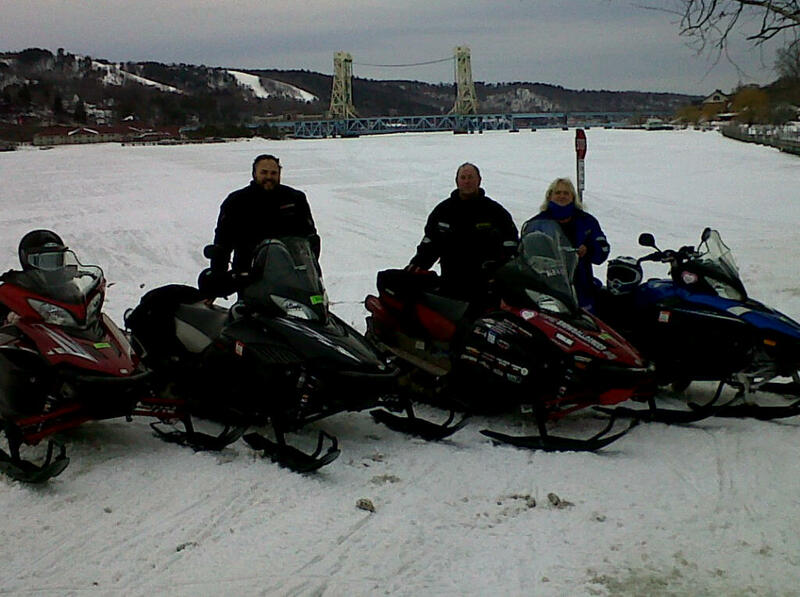 ♦ Travel: Circled around in Iron County, WI. ♦ Notes: I had a great day riding around with the same group of people that were with me yesterday. The groomers have been out doing a great job making the trails nice. Little Emily (who is in 2nd grade) was having fun switching off between sleds; mine, her dad, and Todd. The three kids Courtney, Karlee, and Trevor had a great time riding around Turtle Flowage with me (We were making circles). The kids had the same mileage as me for the day! 🙂 The new track that was put on last night got some good riding today. 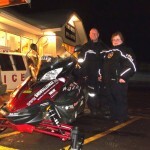 Lastly, a big THANK YOU to Charlie and Lynn Reichert along with Camp 1 for each buying a tank of gas today. I greatly appreciate it. ♦ Notes: I had a great time riding with Ron, Jean, Courtney, Karlee, Trevor, and Emily Kern; along with Doc and Nelli Reichert and Todd. Those Kern girls were riding fast and pushing Todd along all day as I enjoyed myself in the back. We took one of the same trails that I had taken Jane out on for her bucket list ride a few years ago. I kept thinking about her and how much she would have been loving the gorge that we found. It was so beautiful that even the pictures that I took can’t capture the beauty. Well I am going to cut it short and get outside and help Ron change out the track on the sled (as the kids supervise from the hot tub). This track got 12,659 miles on it. ♦ Notes: I had a great time meeting all of the people again today at Cary Mine Convenience during the meet and greet. I decided to make it a short ride within Iron County so that I could make it back to the house to visit with all of the people that have come up to ride with me in the next few days. Otherwise, I am still over whelmed with the amount of support that people give me. I stopped in at a pit stop and people gather to ask questions and take pictures of Mary Jane. Simply amazing. Lastly a big THANK You to Tom Schlangen and Jodi Fleischhacker for bringing up Mary Jane’s 2012 panels. ♦ Travel: Trl 2 down to Iron Mountain and back to Ironwood. ♦ Notes: Today was Mary Jane’s 160th day that she has been ridden! I had a great time meeting people from all over at Cary Mine Convenience Store in Hurley earlier today. I will be there again tomorrow from 11am-2pm. I met people from Granite Falls, MN; Minneapolis, MN; and two brothers from Iowa whose mother passed away at 42 from cancer. When I got on the trails it was so pretty with the nice snow that was out and Mary Jane was looking good with her new hood and panels. I was able to stop and talk with the police in Marenisco and Casper. I always like the look on their faces when I wave them over to me (verses the other way around). Lastly, I got some good advice from a guy at a gas station tonight that I have never thought about….Look out for horses on the trails. Apparently, some got loose one time and he rode right into it which was not a good thing. ♦ Travel: Trl 17 to 8, Manitowish Waters, west to Turtle Flambeau Flowage, trl 12 to 17, trl 8 W to 13 S, trl 17 Ironwood. ♦ Notes: I got a very late start today since I had to change the oil, adjust the chain case, and change the high fax on the sled. A big THANK YOU to Camp ‘1’ for buying a tank of gas today. It is always great stopping in and getting to chat. I am very excited to say that Mary Jane is going to be looking her best at tomorrows meet and greet at Cary Mine Convenience Store in Hurley since the hood and panels are completed and will be here. So I am going to have a quick bite to eat and go give Mary Jane a bath for people to see her tomorrow. If you are in the area please come by and say, hello. I will be there from 11am-2pm. ♦ Travel: Trl 2 to trl 8, Lake Gogebic trl 102 to trl 11, Silver City, trl 1 White Pine, trl 12 Greenland, Mass City, trl 3, Bruce Crossing, trl 8 Wakefield, trl 2 Ironwood, trl 17 to Mercer and back up. 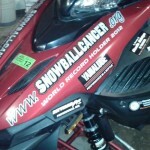 ♦ Notes: Mary Jane’s new panels finally arrived in Paynesville, MN and should be getting the 2012 Sponsorship decals on them soon and on her by the end of the week. I am so excited. She ran pretty good today with her new headlight in. The trails looked much brighter! 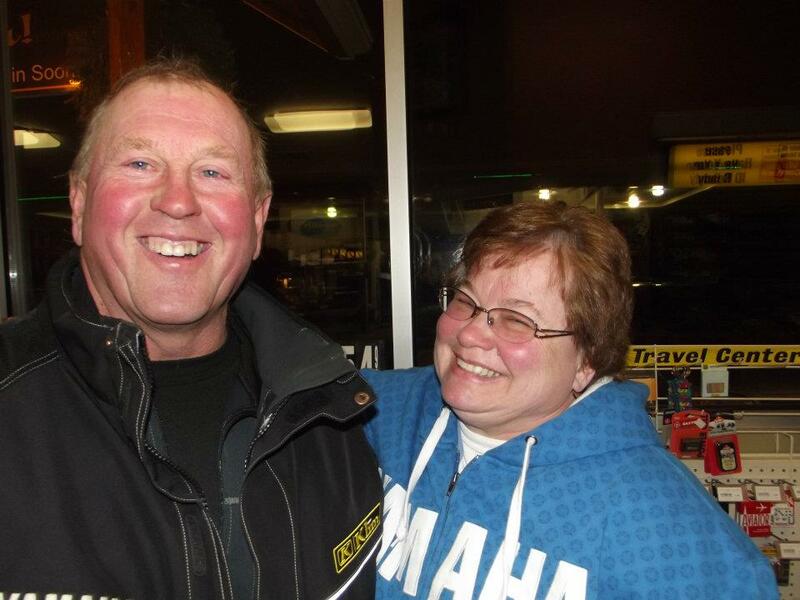 A big THANK YOU to Brian & Margie Willemsen with A-One Trucking for buying a tank of gas today. Brian and I had to break Todd in for sledding since it was his first day out. Otherwise, I did a lot of thinking about all of the people in my life that have passed away from cancer. Also looking up at the moon and knowing that Cole was watching over all of us. I can’t believe it has been two years already since I met his dad and learned about this little boys short but very meaningful life. ♦ Travel: Trl 2 Iron River, trl 15 Sidnaw, trl 8 Bergland, Lake Gogebic, trl 8 Wakefield, trl2 Ironwood, trl 17 6miles down and back up. ♦ Notes: I worked on house work this morning as I waited for the satellite guy to show up. My wife would be proud that I got most of the paint on the wall. It was great getting to speak with the guy as he was fixing the dish. His mother just passed away last Thursday from Ovarian Cancer. After I finally got out on the trails it was just so beautiful. The evergreens were covered in thick white snow that weighed down the branches. With all of this snow it also makes the deer come out on the trails which is even better to see. Then on the lake there was so much fog from the cold and hot temps meeting up. Hopefully, I can get some pictures sent back for people to see the beauty out on the trails. Lastly, tomorrow I am going to put a new headlight in the sled – not bad for over 48,000 miles on it. ♦ Travel: Trl 2 to Watersmeet, trl 107 to 8, Kenton, Sidnaw, trl 12 to 3, Greenland, trl 13 Twin Lakes, trl 3 down to Bruce Crossing, trl 8 Bergland, Wakefield, trl 2 Ironwood. ♦ Notes: I had a great time today playing in the fresh new snow that came. At times Mary Jane was pushing 8 inches along the trails. I had a great day meeting up with Charlie, Charlie, and Jason that came all of the way from Sterling & Standish, Michigan and Illinois. Charlie met me on the Lake of the Clouds last year and took a foundation card. He has been following the website ever since then. His wife, Mary Lynn had cancer and I wish her the best of luck. I really enjoy when people travel from all over to sled with me. It makes the riding even more enjoyable. It was also great running into a gas station owner that saw me on the first run and didn’t think the sled would hold up. He was absolutely amazed! People are always astonished with all of those miles and that the sled still looks so nice. 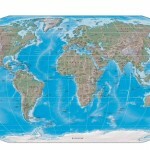 If you would like to meet up with me just simply look me up on the spot tracker and wave me down. Otherwise after a great day, driving back in the snow storm was a wonderful sight to see to finish off the night. ♦ Travel: Headed up to Copper Harbor! trl 2 to trl 8, trl 3 Hancock, trl 17 Calumet, trl 3 up to Copper Harbor, trl 153 to the Point, trl 153 back down to trl 3, trl 17 to trl 3 Hancock, down to Watersmeet, trl 8 to Bergland, Wakefield, trl 2 to Ironwood, lastly put 10 miles riding around town. ♦ Notes: After greasing and checking over Mary Jane I headed up to Copper Harbor! It was around 23 degrees and misty all day. My electric face shield did a great job keeping that ice from freezing. It was very winding up at the peak. Otherwise, I got a good conditioning workout in for myself. It was nice meeting all of the different groups of people that had recognized me and had seen me on the trails over the past couple of years. ♦ Travel: Headed straight down trl 2 on the railroad grade to Iron Mountain and back up to Ironwood. ♦ Notes: It felt like a heat wave today at 12 degrees in the morning and 17 when I came back in. After today’s ride I finally hit an average of 235 miles per day for my first full week. I am hoping to head up to Copper Harbor within the next day or two. So that should help boost me up as well. 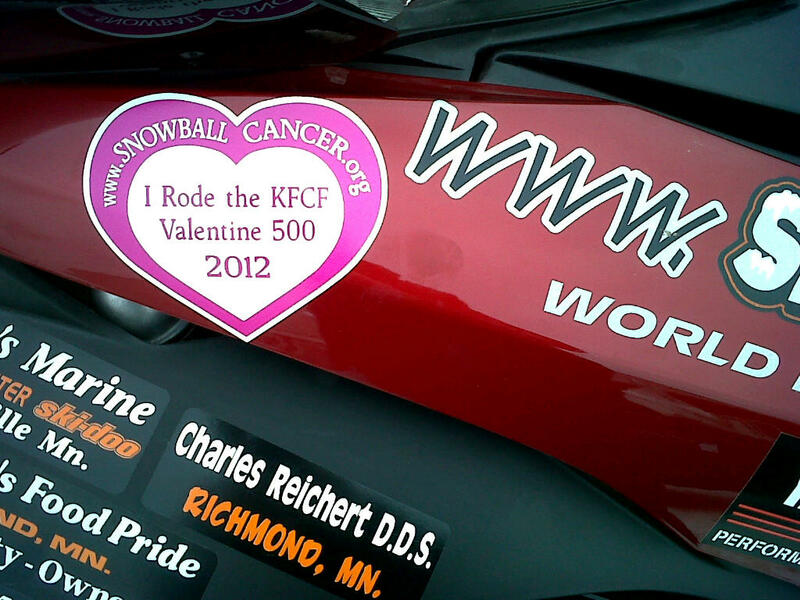 I am getting some good practice in for my Valentine 500+ mile day that will be on Tuesday, February 14th. Hopefully all of the other people who have committed to riding and all who would still like to join are getting their own workouts in. Otherwise, I didn’t see to many people on the trail today but overall great ride and hopefully we can get some more snow soon. ♦ Travel: Stayed in Iron County Wisconsin all day. ♦ Notes: I got a late start today since I was definitely not feeling well after I ate breakfast in the morning. After a good visit with a ‘bucket’, I felt much better (my throat had a little burn but my stomach was good). The temps were still in the negatives today but didn’t feel as bad as yesterday. It was great stopping in at Camp 1 and also running into a group that saw me originally back in 2010 on my first cancer run. They have continued to track me through all 3 runs. That was pretty exciting to hear. Otherwise, I just kept thinking about how I want to hit my goal of ending the snowmobile season with exactly 56,000 miles on Mary Jane. I want her to show the exact age that my mother was when she passed away from cancer – 56. ♦ Travel: Trl 2 Wakefield, trl 8 Bergland, up to Kenton, Sidnaw, Rousseau, trl 12 Mass City, trl 3 Bruce Crossing, trl 8 to Wakefield, trl 2 Ironwood. ♦ Notes: It was -8 when I headed out in the morning and the temp was -10 when I came in at night. It was very cold! However the trails were overall pretty good with only a minor 12 miles that were bad. Brian and I ended up stopping about every 40 miles to warm up along the way so my feet became a bit cold from the change in temps. A big THANK YOU to Marcy at the Hurley Citgo for buying a tank of gas today. I wanted to say hello to Glady that I met in Bruce Crossing whose husband has cancer. It was just great meeting all of the different people at the variety of stops (people from MN, WI, MI, IL). I was a bit struck by people commenting that I was a ‘Living Legend’. ♦ Travel: Trl 2 Wakefield, trl 8 Bergland, trl 102 N to 11, trl 1 to Silver City, White Pine, trl 12 to 101, trl 13 N to Rockland, Greenland, Twin Lakes, trl 3 down to Mass City, Bruce Crossing, trl 8 to Bergland, Lake Gogebic across to Hoop-N-Haller, trl 8 to Wakefield, trl 2 Ironwood then over into Iron County WI, trl 17 S to trl 15, to trl 77 back to Ironwood. ♦ Notes: It was -8 when we woke up this morning so the guys were in no hurry to get outside to quickly. I thought it was just right for a great day of riding. When I was heading up trail 102 I was thinking how beautiful the snow on the trees were 2 years ago when I did my ride for David Gertken who had passed away. I don’t know if I will ever see it as breathe taking as it was that day. Also, thoughts of everyone dear to me that have passed away from cancer and who are currently fighting this horrible disease. When I made my way up to Rockland I ran into Meri Brown (Rachel’s mom). It was great talking with her and catching up on Rachel (hopefully you all remember this young wonderful girl who I met 2 years ago who has been fighting her own battle with cancer). Also, I want to thank the group of guys from Illinois that gave me a donation today that saw me last year on the trails as well. Otherwise, overall a great day of sledding and meeting people. Last I was wondering if the Polaris boys in northern Minnesota are getting ready to ride with the 3 year old piece of steel? ♦ Travel: Trl 2 Wakefield, trl 8 Bergland, ran lake down to trl 1, trl 2 to Watersmeet, trl 107 to Kenton, trl 8 to Bergland, trl 13 down to Root Cellar, lake back up to top, then back to Wakefield, Ironwood. ♦ Notes: I checked my oil this morning and had 2 loose bolts that I had to tighten in the motor. Therefore, I got a bit of a late start today and was so excited to get out the door that I didn’t realize that I had my shirt on backwards all day. Oh well, now I can just re-wear the shirt and no one will know. I had Mike H, Wayne D, and Brian W ride along today. We had a great time and the trails were much better but could still use a bit more than the 4 inches of flurries that we had overnight. A big THANK YOU to Wayne & Christine DuHoux for paying for a tank of gas. Wayne even got a blood blister on his thumb from all of the riding today. Maybe by the end of the week he will be broken in. Otherwise, I had a great time meeting all of the people and hearing all of the stories. Also, it was great seeing the Schultz Family with the 4 girls that I met last year (Brittney, Karla, Kari, & Brooke). ♦ Travel: Trl 2 Wakefield, trl 8 to Bergland, trl 13 Greenland, Twin Lakes, trl 3 down to Mass City, Rousseau, trl 12 up to Mass City, trl 3 Bruces Crossing, trl 8 Bergland, Wakefield, finally trl 2 back to Ironwood. ♦ Notes: I had a great time on the trails with Pat and Nancy Linn riding along on my first day out on the trails. Mary Jane ran great after a minor exhaust valves adjustment. It was great talking with people out and about throughout the day. Like always many more stories from everyone that I meet. I also had a nice stop over at Camp 1. 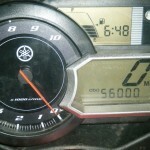 As I was out playing, I was thinking about how I really want to have the odometer read 56K before this winter is over. Also, I have 3 brave souls that have committed to participating in the Valentine’s Day Challenge Run 500+ miles specifically to honor our loved ones. Lastly I don’t want to forget to wish my grandson Tyler a Happy 9th Birthday!